Football remains the centerpiece, but the Music City Bowl also combines the game with Nashville's pro sports, the downtown music scene and a New Year's Eve party and concert. NASHVILLE, Tenn. — Scott Ramsey remembers the first Music City Bowl like it was yesterday. That is, if yesterday was a dreary and cold December day in 1998. Ice was being chipped from the playing surface at Vanderbilt Stadium just hours before kickoff, so as to allow Alabama and Virginia Tech the opportunity to play in front of a sold-out crowd. Fast-forward some decade and a half later and the 16th annual Franklin American Mortgage Music City Bowl has become more than just a bowl game that this year will pit Ole Miss (7-5) and Georgia Tech (7-5) against each other on Monday afternoon at LP Field, home of the NFL’s Tennessee Titans. It has matured into a nearly weeklong festival that starts Friday and combines professional sports, the city’s vibrant downtown music scene, and an outdoors New Year’s Eve party and concert. And the calendar falls perfectly following a mid-week Christmas Day that allows for an extended lead into a local sports weekend and beyond. "What a great music, fun, getaway weekend with sports around it," said Ramsey, president and CEO of the Franklin American Mortgage Music City Bowl as well as executive director of the Nashville Sports Council. "Those of us who were here 20 years ago or so in this town to think that we’ve got a sold-out NHL game on Saturday night, bowl fans rolling in some 30,000 or so out-of-towners, we have a Titans game Sunday, Monday a bowl game, Monday night a (Predators versus) Red Wings game, Tuesday night a downtown concert with 30,000 or 40,000," Ramsey added, "from a citizen standpoint, I couldn’t be more happy being a sports fan and see that weekend and how we can kind of shine." While having an affiliation to host teams from the SEC since Day 1, the Music City Bowl was also affiliated with the Big Ten and has had a contract with the ACC since 2006. Starting next year with the elimination of the BCS, the Music City Bowl and Gator Bowl signed a six-year combination deal to pick a school from either the Big Ten or ACC, allowing for more flexibility in team matchups. According to its Web site, the Music City Bowl though the years has generated more than $207 million in local economic impact and distributed more than $34 million to participating schools. The festivities begin Friday night with the private Official Welcome Party on the General Jackson Showboat for student-athletes, coaches, SEC and ACC administrators, participating school entourage, bowl sponsors and partners, and Nashville dignitaries. The first event open to the public is Saturday morning’s Fellowship of Christian Athletes breakfast at Gaylord Opryland Resort. Saturday’s itinerary for the schools include a Wives & Daughters Tour, a players party while attending and after the Predators game, and a VIP Dinner Saturday night at the Country Music Hall of Fame. On Sunday, the Coaches Brunch at Wildhorse Saloon is sold out, but the public can attend at 4 p.m. a world championship hot chicken wing-eating contest that will feature players from both teams, followed by MusicFest and Battle of the Bands downtown at 5 p.m.
"From Day 1, we wanted to create an event," Ramsey said. "The challenge of (former Nashville) mayor (Phil) Bredesen was to take this week that is typically the worst tourism week of the year, and ask can we add sports?" Ramsey said. "Or can we take a bowl game to kind of infuse some tourist impact, but also be a national platform on the community to bring people in? "So, 16 years later, we have kind of stuck with that kind of plan." Last year, Ole Miss fans helped make the BBVA Compass Bowl in Birmingham, Ala., a success with a huge turnout, leaving Ramsey to expect the same from Rebels fans this year at the Music City Bowl. He is also excited about Georgia Tech’s first appearance in the game; Ole Miss lost to West Virginia in the 2000 game in front of 47,119. The Music City Bowl has sold out four times at LP Field with the record being 69,134 that watched Tennessee lose to North Carolina in 2010. Two of the last five years, hometown Vanderbilt has participated and beat North Carolina State last year and Boston College in 2008. But having two teams and their fan bases, especially two excited ones like this year; travel to Nashville to stay and spend money is the perfect model for success. "When you get that four- or five-hour drive, people can kind of dictate their time here," Ramsey said. "We hope they spend four or five nights, but if they want to spend two or three or whatever, they are more flexible. And that’s typically been a better business plan for us. "I will be anxious to see the makeup of our crowd out of town or in town. I feel like that makeup is really going to be heavily skewed out of town this year. There is a big difference from the business side when you look at 55,000 to 60,000 folks in the stadium. The makeup really translates into business in a different way." The Rebels are 9-1 in their last 10 bowl games and have won their last five, which is tied for the longest active bowl win streak among FBS schools. Before Christmas, Ole Miss sold out its original allotment of 12,000 tickets and totaled 13,244 sold overall. The Rebels are expected to sell out its ticket surplus as well. "Rebel Nation is once again showing why we are one of the most attractive bowl teams in the nation," Ole Miss athletic director Ross Bjork said in a statement. "We appreciate the unwavering support of our fans and look forward to seeing another outstanding postseason crowd for the Music City Encore." Georgia Tech is competing in its 17th straight bowl game and 42nd in school history. 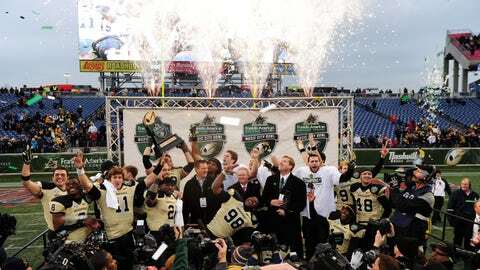 The Yellow Jackets broke a seven-game bowl losing streak last year by beating Southern Cal in the Sun Bowl. "We are very pleased to be heading to the city of Nashville to play in the Franklin American Mortgage Music City Bowl," Georgia Tech coach Paul Johnson said. "To play a bowl game within driving distance for our fans, and to play against a high-quality opponent in Ole Miss, is a great opportunity."